You write a blog and are not getting the audience to read it. It is quite frustrating to see that the blogs where you have put in so much effort are not reaping anything in terms of traffic. You did everything and things are not picking up and it has slowed down your progress and even your motivation. If you are writing a blog to earn money then you need to maintain traffic. It is important to generate hits for your website to get popular. But how can you do that? How can you Generate Free Traffic for your Website? There are many ways to generate traffic for free. You can share your work on your Facebook Page and share it in relevant groups to let the members know what you are up to. You can tweet about it on Twitter with the hashtag so that other members can also retrieve your tweet on search. You can create a picture post on Pinterest. There is also Flipboard where you can transform your writing into magazine style for more viewership. You don’t have to be in competition with other bloggers to an extent that you stop maintaining any relationship with your counterparts. It is important to make your blog different than others in the market but it is equally important to work with them or appreciate them to ensure that they also do the same for your work. One blogger’s comment reaches to another and it becomes a chain reaction where you can tap into their audience that will help you increase your traffic. In the blogger’s world, one needs to be with the other and help each other out in terms of traffic and popularity. You can always join a group of bloggers which are easily available on social media. For example, you can join a group on Facebook and initiate a conversation to start with. The conversation could be regarding your blog or your blogging skills. You can also comment on someone else’s update and start being popular in the group. 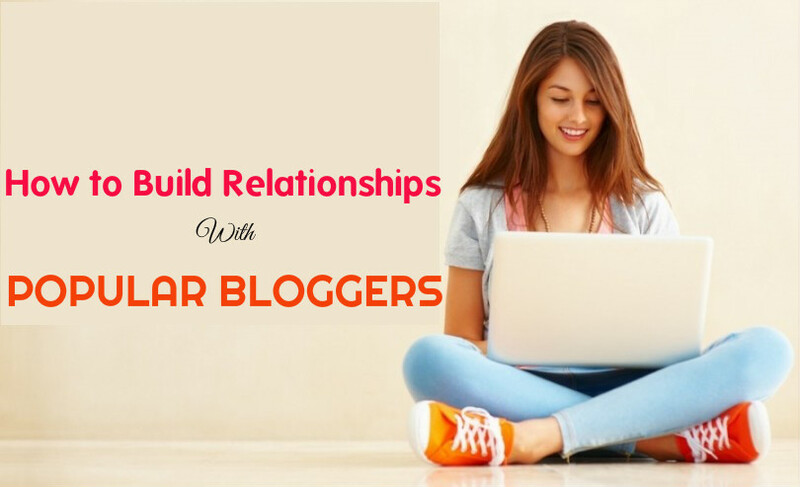 The curiosity of what you write will lead many members towards your website and hence you would start with a relationship with other bloggers. These influencers will help you through your journey of blogging. Share their updates and give an additional supportive description to it. By doing one or many of pointers you would be showing the support which in turn you would receive their support and motivation when you need it. Community managers help the newcomers to know what the forum or website is all about and helps them through it. They also help in creating videos or tutorials that can help the new members you use the forum or community in an effective way. By being an informal community manager you are creating goodwill for yourself with the community members as you are the helper and they are benefiting from you. You as a manager can set rules that will help the community to run better and not deviate from its goal. You will find many members posting queries in the group that can be other than blogging, for e.g., how to use a gadget or do you know anyone who can help us do…. So when you answer their queries you help them through their goals and relieving them from their frustrations. You can develop a relationship with a friend who helps others in need. But what would you gain from that? Well, they would certainly come up and help you when you need one. Bloggers often conduct seminars based on their expertise. You can attend their seminars, take a few notes and pictures and also at the same time absorb the knowledge that they are sharing. Once you are back to your abode, you can type a column or a post on your website stating what you learned today in a webinar or seminar. Post pictures and keynotes from the session and also mention how thought-provoking and inspirational it was for you to attend. You can lend your expertise to your influencers, giving your knowledge and opinion to help them build their brand. You can understand what they want and what you can give them in return to help them get rid of their hurdles. Let them know that you can give them an hour of business consulting session for free and if they find it useful you can go ahead further. This will help you to build a relationship no matter where the influencer is and in turn, get recommended to others via the relation. You just received a message that your influencer has released a new book or a new column or a new product which out in the market and he or she wants you to review it. Indirectly they are asking for you to market their new baby. So, what can you do in here? You can review their products and let them know that you have done so by writing a post on your blog or any other place. You can similarly ask them to review your new writings or product, helping you to get more eyes on you with the help of the influencers. Everyone loves to talk to a person who is intelligent and knows his or her game in and out. You develop a deep relationship which can lead to longer relationships in the future. The best way to do so is to interview relevant people based on your focused area. You can pick up people who have excelled in those areas, and get in touch with them for an interview session. IT is a golden opportunity to introduce yourselves to veterans or expert group of people and showcase what you have to offer. It will help in promoting them as well as yourself. We become members of many groups and tend to ignore a small glitch like an error or a pop-up that should be there or a spelling mistake and much more. The reason for doing so could be from being shy to let them know to not caring how their site is behaving to Just like attitude. But letting them know what can be an issue on their site proactively can help them and in turn help you in the future. If there is something that you have missed then these people will stand for you to let you know that there is a problem which you can correct as soon as possible. This is the diciest area that you can get into for creating blogger relationships. When you are running an organization than your subordinates will be men and women who keep nodding their head on anything and everything that you say. You can be the mirror who is honest and shows what you see as it is with no changes. But you need to be careful as you can’t go overboard with your comments since that can be taken as an offense. Similarly, you can’t comment on any silly item and make a hue and cry about it as that can term you as unprofessional. You can prove yourself to be proactive by understanding the needs of the community. If you feel that the categorization is needed then go ahead and do so. For example, you can create a new category that says “Top 10 frustrations in the blogger world”. Here you can add top 10 posts in the forum that have been discussed extensively. This will prove that you are helping the community to get to their issues faster and in an effective manner. As a blogger, you end up reading many articles and researching on the web to know what could be your next target. Other than that you do note on some interesting styles which known writers have adapted in their posts. You tend to work on those lines and in the process embedding the inspiration into your writing. Do remember that inspiration should not turn into imitation as that would spoil your reputation as a writer. A loyal customer ends up to be a loyal friend too. You have a shop from where you buy things regularly and hence, slowly you develop a relationship with the owner. The owner helps you to find what you want either from his shop or any other place. It is important that you become an online customer and develop the same relationship so that you work out your way to developing new and old blogger relationships. If you have a trending blog you will definitely face this situation sooner or later. A blogger would get in touch with you to write a guest post for your website. Once you agree with the content, you post the relevant article on your website and the first thing that you notice is that there are many unique visitors for the day. The reason for such change is the fact the guest blogger has shared it on his or her social networking site allowing the audience to view the post on your website. Similarly, you can also do the same and create fruitful relationships with other website owners. Once you develop a formal relationship with a bunch of influencers in the internet world, it is the time that you meet them in person. How does that help? Well talking face to face is more effective in maintaining and strengthens a relationship rather than just talking online. Meet over informal occasions like coffee to just sit and chat on various topics that come to your mind. Strengthen your bond and hence your work relationship with them. You got in touch with them via your post or their post and you have kept your communication restricted to that. Well, it does help your bond to go better if you go a little further in your relationship. It is like dating, you can’t stay in one position for long, you have to show whether you are committed to your relationship and how further can you go with it. So, go ahead and show your commitment by inviting them to your social networking site as this will help them to know you and your work personally. They can see the various posts that you have shared with them, about them and much more. Building blogger relationships with other bloggers is not about knowing what they are up to and what they can do but for sharing and co-existing in the internet world. There are many viewers and attracting them solely from your updates is not as fruitful as sharing it from other people’s website. It is like a high school, the more popular you are the more people would like to know you. So go ahead and make yourself popular with your wits and other skills that will help you to generate the traffic. You need to create a perfect marriage between each other to ensure the trust, loyalty and faith for life long.